You’ve got your prom tux, but you’re not ready for the big night just yet! To look your best at prom, there are plenty of other details you shouldn’t forget, including prom accessories which can bring your outfit to the next level. 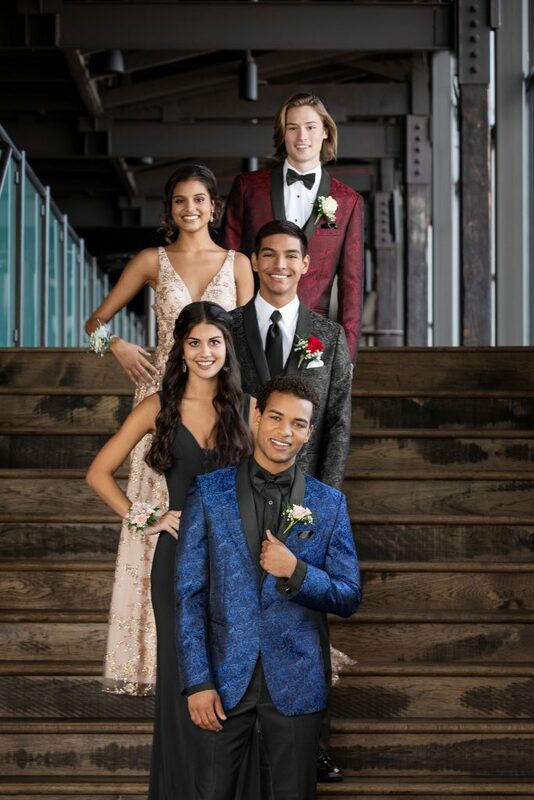 We know that choosing a prom outfit for guys can be stressful if you’ve never picked formalwear before, but we’re here to help! You can’t go wrong with a classic black-and-white look, especially if you’re overwhelmed by all the choices out there. Add a black bow tie and black cummerbund to a black tuxedo that fits you well, and you’ll look great. For some subtle texture and visual interest, choose a patterned bow tie instead of solid black. Then, add a pair of cufflinks in either silver or gold. Whichever metal you choose, make sure the other metals in your outfit match: your watch, tie bar, and belt buckle. Finish your look with black leather shoes and a boutonniere for a little touch of color. If classic isn’t your thing, be bold and wild with your prom look! Most proms have a semi-formal dress code, but it typically isn’t strictly enforced. If you’re wearing a colored suit other than black or white, ditch the tie and pair it with a solid colored shirt. For example, if your prom suit is maroon or bright blue, try a light pink formal shirt, brown belt, and polished brown shoes. If you’re wearing a blue or burgundy tuxedo, stick with a white shirt and black bow tie to let the color of your tux shine. You can also add color to a neutral suit or tux with your shoes. If your prom is less formal, swap your shiny dress shoes for a pair of preppy suede loafers, bold-colored leather sneakers, or retro Chelsea boots. Suspenders and a vest (also called a waistcoat) can add cool vintage vibes to a prom suit. You’ll also fit right in if your prom has a Great Gatsby or casino night theme. Wear a solid or patterned 3-piece suit (jacket, vest, and pants) for a dapper outfit. For example, a patterned grey suit looks great with a solid white shirt, matching patterned vest, black tie, black suspenders, and black leather shoes. You can always remove your jacket if you get too warm and still look polished in your vest. Whether you’re going with a date or a big group of friends, it can be fun coordinating your outfits together. Rather than matching outfits or colors exactly with a date, try to make sure your look complements theirs. You can do this by choosing a matching boutonniere, pocket square or tie in the same color as your date’s dress or accessory. Or, ask your group of friends what colors they’re wearing. Are they going all out for your prom’s Hollywood, masquerade, or under the sea theme? Are they wearing suits or tuxedos? Remember that you don’t have to match, but if you’re having trouble deciding on your outfit, knowing what your friends or date are wearing can help you narrow down your choices. The most important thing to remember when choosing your prom outfit is finding pieces and accessories that make you feel excited about prom! When your suit or tuxedo fits you well, you’ll feel confident and comfortable enough to dance and hang out with your friends all night. Be sure to find prom accessories that show off your personality and complete your prom look.